The Cologne Cardiovascular Research Center (CCRC) is centrally involved in coordinating all basic, translational, and clinical cardiovascular research activities at the University of Cologne (UoC) as well as at non-University institutions in Cologne. Moreover, the CCRC aims to provide a structured research training platform for both researchers and clinicians. To this end, in 2013, the applicants of this consortium (led by S. Rosenkranz and S. Baldus; other members: T. Benzing, J. Brüning, A. Klinke, M. Pasparakis, V. Rudolph, B. Schumacher, A. Trifunovic) successfully obtained seed funds from the UoC’s Medical Faculty through a competetive selection process to launch a new structured Graduate Program in Cardiovascular Sciences at the UoC entitled “Inflammatory Pathways underlying Vascular Remodeling”. 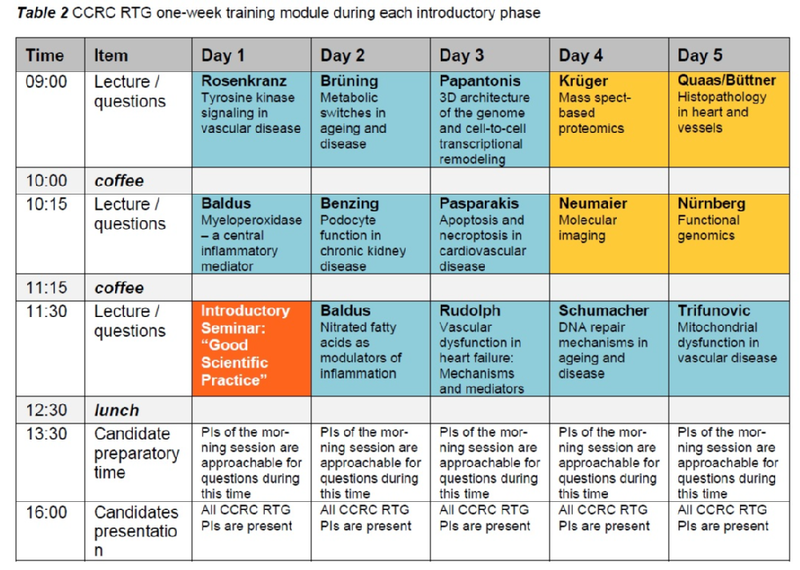 In detail, this program was initiated as the first step to establish structured research training in basic cardiovascular science as well as large clinical programs on structural heart disease, electrophysiology, kidney disease, and pulmonary hypertension. A unique aspect of our program is that it actively encourages highly talented MD students to enroll, thereby supporting their research track within the Medical Faculty. Thus, the CCRC’s Graduate Program not only aims to train the next generation of cardiovascular scientists, but also to provide an ideal environment for aspiring MD researchers. Since the program is specifically designed to foster close collaborations between different groups in general and basic researchers and clinicians in particular, interdisciplinary collaborations are a central core to our approach. Of note is that this previously (in 2013) established Graduate Program has also brought direct benefits to PIs and PhD/MD students alike. For example, it has allowed members of the consortium to establish new links and collaborations between research groups (e.g., see appendix C), to expand on opportunities in biomedical graduate education (current CCRC program), as well as to raise the overall research profile of the CCRC and its associates. This CCRC’s Graduate Program in Cardiovascular Sciences was approved by the Doctoral Graduation Committee of the Medical and Natural Science Faculties of the UoC in terms of its scientific focus, the graduate program structure, as well as selection criteria and educational program. Moreover, members of this program have access to rotating positions established within the CMMC and the Medical Faculty to relieve talented MDs from their clinical duties. After an international call, a first cohort of 8 PhD students (3 females, 5 males) from 5 different countries was recruited. The students’ projects are embedded in a strong interdisciplinary research network of 10 experienced scientists and clinicians and are supported by state-of-the-art core facilities and multiple research support services. Further, hands-on mentoring, regular progress reports, and pertaining research training with a strong reference to clinically relevant questions also characterize this program. Finally, lab activities are complemented by a rich curriculum of lectures, retreats, and career development training opportunities such as statistical courses and scientific soft skill workshops, e.g. presentation and writing. Due to the initial success of the CCRC’s Graduate Program, we now intend to build on and broaden this program to encompass the topic of cellular stress signaling as a switch to vascular dysfunction. Thus, our latest initiative is ideally placed to pool extensive research expertise on elucidating the underlying basic molecular and cellular mechanisms of vascular disease and facilitating the translation of newly generated knowledge and discoveries into novel interventions and treatments as well as to establish a new cardiovascular research training network (CCRC RTG) aimed at producing the next generation of cardiovascular researchers. The overall educational aim of this RTG is to train highly talented PhD/MD students in cardiovascular science as a prelude to producing the next generation of researchers and clinicians in this important area. To this end, one of our specific training goals is for PhD/MD students to complete their research within a three- to four-year time frame with a first author double-digit impact factor publication while receiving a top-level scientific education and appropriate career development training. All PI´s make a commitment that they will provide funding for PhD/MD students after a period of three years. In case of any difficulties, the Medical Faculty will provide funding after the three-year period until completion of the thesis in individual cases. In addition, the Medical Faculty will provide rotating positions for MD´s (up to 3 per funding period) to relieve research-oriented MD´s from their clinical duties and facilitate their admission into the CCRC MD/PhD program. A unique aspect of this new RTG program is the basic research mechanism-focused approach and the close link to the clinical setting at the UoC Heart Center and beyond. Our vision is that the proposed RTG program will provide an innovative and interdisciplinary education for our PhD/MD students by integrating cutting-edge research projects with collaborative supervision complemented by a structured training program – all of which will be hosted within a firmly established network of researchers and clinicians and outstanding facilities and support services (see below). This new RTG will be run by a dedicated part-time coordinator and each PI taking a CCRC RTG student will provide three years’ of guaranteed funding. To achieve the educational aim and to ensure a structured, high-level, and quality-controlled scientific education as well as a successful completion of the PhD/MD research projects, there is a core curriculum of the RTG, which intends to (1) give students the opportunity to find the topic for their thesis which best suits their main interest, (2) optimally promote their research and education, and (3) ensure their development in a framework and schedule that helps them to keep track of their scientific achievements, but make necessary adjustments within their research projects (Table 1). 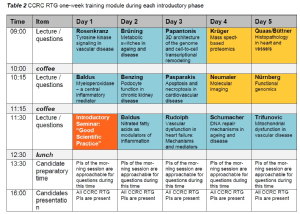 The introductory phase, which will last for approximately 5 weeks, will facilitate the student´s arrival in Cologne and start in the program, and will include a 3-day “Meet & Greet” event, a one week Training Module given by the CCRC PI´s and associated researchers, and 1-day visits to the laboratories of the participating PI´s as well as the core facilities. To better help our new PhD/MD students integrate into their new labs as well as surroundings, we will have a ‘Meet & Greet’ 3-day event to ensure that the students can settle in as quickly as possible. Each new cohort will be provided with an information pack covering useful structures at the UoC, e.g. Welcome and International offices, as well as information on practical issues such as registration with the local authorities and opening a bank account. They will also be assisted with housing and childcare issues should it be necessary. Further, the PhD/MD students will also receive project management training as well as a lecture on “responsible research” to better facilitate a highly productive start to their research projects. In addition, they will also be informed about what will be expected from them during their participation in this RTG, e.g. progress reports and attendance of lectures and trainings. Finally, these activities will be complemented by some informal networking events aimed at integrating the class as a whole as well as allowing them to better know other faculty members at the UoC as well as the city of Cologne itself. During the second week, students will be offered a compact lecture series that will give the incoming PhD/MD students a scientific introduction and overview to the areas of research offered by the RTG (Table 2). The lectures will be held by the participating PIs, and the associated researchers representing the core facilities. Furthermore, this training module will also contain an introductory seminar on “Good Scientific Practice” (will be provided by the GSfBS/IPMM). Starting in WS 2018/2019, the GSfBS, supported by the IPMM, will also offer a seminar series covering the topic „Good scientific practice“. The Training Module will be followed by 1-day lab visits to the labs of each of the participating PIs, as well as the core facilities. This will facilitate personal communications and getting to know each other, and further inform the incoming students about ongoing research in the participating labs and technical facilities. Additionally, students will be offered a 1-day tour through the clinics and medical facilities at the UoC Heart Center to get accustemed to the local structures in cardiovascular medicine and to learn about the clinical relevance of their research. The RTG will have a three-pronged approach to ensure outstanding research training for its participants by (1) ensuring high quality in cardiovascular PhD/MD training, (2) promoting international visibility and selecting the best PhD/MD students, and (3) offering a diverse arrage of medical-oriented, research-related, and career development activities and training modules. Figure 4.2. Concept for a scientific career support in basic research for highly talented MD´s and MD students within the CCRC-RTG and UoC framework. This consortium recognizes that performing an outstanding PhD can be a challenge. Therefore, to better help facilitate this process in terms of educational and training experience, scientific productivity, and ultimately, career success, all PhD projects will be assessed internally to ensure innovative and cutting-edge projects which can be realistically performed within the three (four)-year timeframe. Moreover, we will establish a collaborative supervisional approach in which each student will have access to two PIs to discuss problems and progress on a regular basis. Finally, to ensure that the project is suitably advancing, each student will have regular meetings with his/her Thesis Advisory Committee (TAC). Each MD/PhD student will be guided, mentored, and supported by a Thesis Advisory Committee (TAC), consisting of the respective PI of the project, two independent senior scientists with complementary expertise, and a postdoctoral fellow. The inclusion of a postdoctoral fellow at TAC meetings is a new measure aimed at broadening his/her scientific education in general and enhancing their supervision and mentoring skills in particular as a first step to greater scientific independence. The highly collaborative and interdisciplinary approach of this initiative was a key priority for the selection of the participating PIs and research projects aiming to make basic researchers and clinicians join ranks to promote bench-to-bedside approaches. Hence, we explicitly will have highly collaborative and cutting-edge research projects between the host lab and at least one other member of the RTG. This novel approach will ensure shared responsibility of supervising and supporting the PhD/MD students and overall better hands-on mentoring. The CCRC RTG will be embedded in the established structured programs of the IPMM and GSfBS for which stringent quality control (QC) measures are already in place. To maintain these high levels of education, this RTG will set up a Management Committee that will consist of the CCRC RTG’s coordinator, all participating PIs, two PhD/MD student representatives, a part-time CCRC central management officer, and the IPMM and GSfBS coordinators. A central management and service office headed by the CCRC RTG’s coordinator will provide administrative support for all aspects of the program, such as recruiting, facilitating the assessment process of applicant eligibility and selection, supporting the admissions process, monitoring of research progress, as well as scheduling and organizing training activities, etc. For detailed information on quality control measures, see section 5. For highly talented MDs and MD students who are interested in basic research science, supporting instruments are already established at the UoC at different levels. For example, the “Research Track” aims at informing interested and motivated MD students about basic and translational research opportunities as a first step to recruiting them as doctoral candidates. Moreover, the IPMM specifically offers an “MD/PhD” interdisciplinary graduate program that provides medically-oriented additional training and educational oppor-tunities. Within this framework, the CCRC provides specific projects and training in cardiovascular science. Finally, the Medical Faculty has funds available that can relieve MD researchers from their clinical duties while they pursue a research career, and such rotation position will be available to the CCRC (up to 3 per funding period, provided by the Medical Faculty). In accor-dance with established structures at UoC, the CCRC RTG offers highly talented MD´s and MD students to be enrolled into the program as early career “short-term” stipends, through doctoral fellowships in medicine, and via the MD/PhD program (Figure 4.2; see also section 7.1). This program will benefit from a long-standing experience that Cologne’s Graduate programs (particularly the IPMM and GSfBS) have with the selection procedures for doctoral candidates. Building on this experience, applying candidates will go through a highly competitive three-step selection process. This RTG will aim to recruit students with a Master´s degree in biomedical sciences as well as high potentials holding a degree from a University of Applied Sciences, i.e. top 10% of their cohort, but will also be open for MD´s. We envision an initial single intake of 9 PhD students and a postdoctoral fellow. Additionally, the RTG will allow ambitious Bachelor students (through a fast track option) and MD students (via the research track) to enter the PhD program. The selection procedure is detailed in section 5.1 (announcements and selection procedure). While it is essential that our PhD/MD students become specialists in their choosen research field, we also aim for a broader education to ensure the overall research horizon is not too narrow as well as to better foster interdisciplinary thinking. To achieve this goal, the CCRC RTG will offer a variety of additional medical-oriented and research-related activities and training modules. 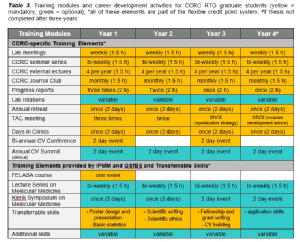 These include CCRC-specific modules as well as more general training elements provided by the umbrella structures of the UoC (Table 3). For example, a regular weekly CCRC lecture series, where students will be taught about various aspects of molecular cardiology in disease-related processes, and an annual 2- day CCRC RTG retreat are planned. Moreover, a comprehensive study program comprising a lecture series on general aspects of molecular medicine as well as a number of research-related and career development workshops will be on offer via the up-and-running activities of the core programs of both the IPMM and GSfBS. Here, PhD/MD students may choose from a diverse and wide variety of options, including paper and grant writing, poster design, presentation, statistical analysis, and data visualization – to name but a few. Within the proposed RTG program, PhD/MD students will be expected to accrue a total of 20 credit points over their 3- to 4-year PhD program (1 credit = 30 hours workload). These credit points can also be gained by active participation in retreats and conferences as well as skills building activities, e.g. inviting and hosting international guest speakers or meetings organizations. The following activities and training modules have already been established at the UoC and will form part of the structured educational program of the CCRC RTG’s core curriculum. The PI supervisor and the hosting research group are expected to closely mentor and support the PhD/MD student. We envision that pertaining feedback and advice will be provided at least on a weekly basis and be complimented by regular lab and TAC meetings. We also strongly encourage joint lab meetings between different participating groups to better generate scientific discussion, interdisciplinary thinking, and broader understanding across research fields. The CCRC seminar series specifically focuses on cardiovascular science and is held every other week. Currently, we invite both internal as well as external guest speakers from other institutes. In the future, we intend to expand our activities for external guest speakers, by sending our PhD/MD students an abstract and a list of publications to allow them to more fully prepare for and participate in the post-seminar discussion. Our aim is to facilitate fruitful scientific discussion within our program and to promote better networking. In this context, PhD/MD students will be encouraged to suggest possible external guest speakers and serve as their hosts once they are on-site. All seminars are followed by a get-together to promote further discussion and networking. Participation will be mandatory for all CCRC RTG PhD/MD students. Each PhD/MD student and the postdoc will be expected to give one literature club seminar per year to promote the interchange and discussion of the latest advances in cardiovascular research. A secondary aim is to also encourage critical and analytic thinking skills as well as build confidence for presentation technique. PhD/MD students will be asked to organize an annual 2-day off-site CCRC RTG retreat in which they will present their work (current results and future research plans) to the whole Managing Committee and the other members of the RTG. Here, progress of the projects can be critically reviewed, constructive feedback given about possible next research steps and direction, as well as network building and scientific exchange. Alumni members will also be invited to give career talks to the new members of the CCRC RTG. Specifically, this annual retreat will foster interaction, scientific discussion, and active intellectual engagement between PhD/MD students and PIs from different research groups as well as alumni. This CCRC RTG will provide our PhD/MD students with the opportunity to perform 1-3 month lab rotations if they wish. This approach will better enable our students to make strategic choices about where they will perform their doctoral research. It will also have the added benefit of broadening his/her scientific horizons with respect to theoretical knowledge, experimental skills, mentoring experience, and networking, as well as promoting a more interdisciplinary working style. Once a year, our PhD/MD students will spend two days in a clinical setting with the expressed aim of better understanding cardiovascular medicine in a patient-oriented environment. We anticipate that our PhD/MD students will gain rich insights and fresh perspectives about patient-specific issues, technical procedures, and front-line medical needs, and thereby, encourage more translational cardiovascular science thinking. Bi-annual 2-day "Cologne Conference on Cardiovascular Disease"
A 2-day cardio-vascular disease conference was established over 20 years ago at the UoC Campus and focuses on bridging the gap between molecular and translational cardiovascular science. This bi-annual event normally attracts over 200 participants from across the globe. Many of these attendees are national and international leading scientists within this field. The next conference is planned for 2019 and will focus on heart failure and pulmonary hypertension. Annual 2-day "Cologne Cardiovascular Summit"
This 2-day cardiovascular summit was established in 2013 and focuses on clinical and translational aspects of cardiovascular medicine, including lectures on newly emerging topics by renowned scientific and medical experts in the field as well as live cases from the operations room. It is routinely attended by over 200 participants. The IPMM at the CMMC offers a regular lecture series that focuses on experimental medicine in general and on molecular medicine in clinics in particular. It is followed by an informal get-toegether. The IPMM and GSfBS offer a comprehensive range of high level on-site regular training, including scientific paper and fellowship/grant writing, poster design and oral presentations, statistical and data visualization, scientific ethics and good research practice, project management, IP and patenting issues, etc. A specific workshop on „Ethics, Theory of Sciences and Legislation in Research“ will be provided by the IPMM/IPHS (one workshop / year). The GSfBS also offers additional training to promote the career development of female scientists (see section 5.3). To promote a better understanding of alternative careers, students can also attend career days organized by the CMMC as part of the IPMM program. Local speakers as well as alumni are invited to talk about their career paths and how they made the transiton from academic research to industry and the wider market. Within the framework of IPMM and GSfBS, there are multiple opportunties for methods learning. For example, the CMMC/CECAD Proteomics Facility offers training on preparative protein chromatography, quantitative proteomics, 2-dimensional gel electrophoresis, etc. Our PhD/MD students will also be encouraged to apply to participate in suitable EMBO courses and funds will be made available for successful applicants. The postdoc and PhD participants of this RTG will also be able to attend the Postdoc Career Program (PCP) that offers tailored postdoctoral career development options and the Albert Magnus Graduate Center that offers cross-faculty graduate training as well as language courses, respectively. This long-established world-renowned annual symposium attracts hundreds of participants each year and hosts internationally leading experts, enabling all to keep up with the latest advances in the field of molecular medicine as well as build their scientific network.